Have you ever wondered why fluoride is in our water? I get a lot of questions from all of you on this subject and I’ve been meaning to write about it for a long time. Mellisa Gallico is here to share all about the dangers of fluoride and its hidden connection to a common problem: acne. Melissa is no rookie when it comes to research. Get a load of this bio…she graduated with honors from Georgetown and has a masters from the University of St. Andrews in Scotland. She’s a former military intelligence officer, a Fulbright Scholar, and an FBI Intelligence Analyst. So how did she come to be a fluoride expert? As with most of my guests, it’s because she had to tackle health problems personally. 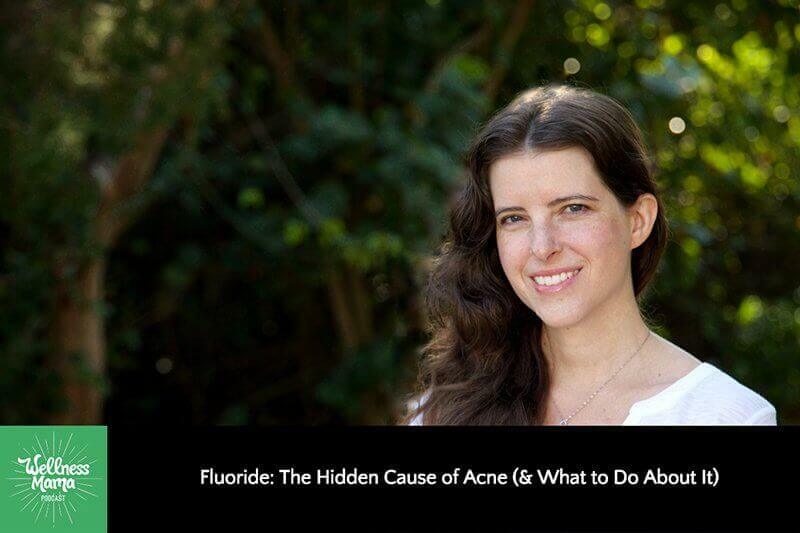 Take a listen and if you want to hear more from her, check out her two fascinating books The Hidden Cause of Acne and F Is for Fluorite. Are you concerned about fluoride in water? Do you have a question you’d like answered? Leave a comment! Also, if you’ve enjoyed this podcast episode, please take two minutes to leave me a review on iTunes. I value knowing what you think and this helps other moms find the podcast as well! This podcast is brought to you by Mother Dirt’s amazing AO+ Mist. Many of us realize just how important the gut microbiome is to health and are familiar with things like probiotics and fermented foods that can help optimize gut health. But did you know that our bodies are made up of many bacterial ecosystems and that without them, our health would crumble. Our skin is the largest ecosystem or microbiome and often it needs a little help. Modern hygiene products deplete the necessary beneficial bacteria on our skin and the AO+ Mist’s patented Ammonia-Oxidizing Bacteria (AOB) work by consuming the ammonia in your sweat and producing beneficial byproducts for your skin, which brings balance to your skin biome and helps restore its natural ecosystem. What I love about this mist is that is has almost completely removed the need for me to wear deodorant since ammonia is the stinky part of sweat, and it has become a vital part of my skin care routine. All Mother Dirt products are plant-based with minimal ingredients, and they are gentle, effective and great for the whole family. You can save 20% on your first purchase with code FREESHIP20 at motherdirt.com/wellnessmama to learn more and buy now. This episode is brought to you by Perfect Keto. I have heard from a lot of you who are trying the keto diet right now. And Perfect Keto has several products that make it so much easier and tastier. They have keto-friendly sports drinks with zero additives, zero carbs, and only high-quality ingredients. And I’ve gotten so many questions about this. They also have exogenous ketones that raise blood ketone levels up to 1.5 millimoles per liter. So that would be simulating a fast. A lot of people use these exogenous ketones to increase mental performance, and energy production, and fat burning without the need to do extended fasting. And Perfect Keto really just helps make ketosis available to everyone, everywhere, all the time without the need to do extended fasting, like I said. You can check out these and all of their other products at perfectketo.com/wellnessmama. And if you use the code HEALTHYMOMS, all uppercase, you can save 20% on any order.